Fall brings a lot of important dates: back to school, Halloween, Thanksgiving... and the start of hunting season. If your fall wardrobe is mostly camo and orange, you need Born to Hunt. 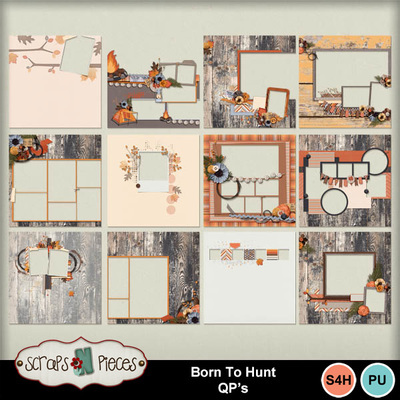 This woodsy kit is perfect for scrapping the hunter in your life, combining a heavy dose of theming with colors perfectly suited for fun fall layouts too (and no camo in sight!). If you love someone who prefers hunting season to pumpkin spice, you need Born to Hunt. Contains 12 pages with spots for 44 photos.